Do you struggle with pool algae every summer? 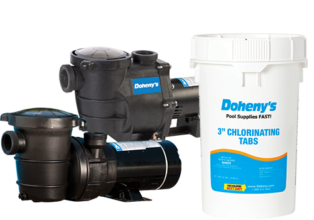 Pool algae is no match for Super Algaecide Plus from Doheny's! Its powerful formula of chelated copper kills all common algae growth: stubborn green, black algae, and even kills persistent yellow mustard algae. Our brand of algaecide will not foam or cloud your swimming pool water and is effective in all parts of the country. Not convinced that Super Algaecide Plus is the right product for your pool algae problems? Read a few customer reviews below to find out why Super Algaecide Plus is a best-seller or give us a call to discuss your algaecide needs with a cool pool pro at 1.800.574.7665.